Eastern skipper Brian Bowen meets with the Eagle infield, during the Division IV district semifinal on May 14 in Chillicothe, Ohio. Eastern senior Austin Coleman releases a pitch, during the Eagles’ win over Waterford on May 1 in Tuppers Plains, Ohio. LANCASTER, Ohio — How sweet it is. The Eastern baseball team baseball team brings a 13-game winning streak into Thursday afternoon’s Division IV, Region 15 semifinal at Beavers Field in Fairfield County, where the 26-2 Eagles will battle 18-8 Centerburg. Eastern — the Tri-Valley Conference Hocking Division champion — is back in the regional tournament for the second time in three seasons and the 11th time in school history. However, the Eagles are still in search of their first win at the regional level. This will be the seventh time the Eagles have been led into the Sweet 16 by head coach Brian Bowen, who holds a 276-155 record in his 18-year tenure. 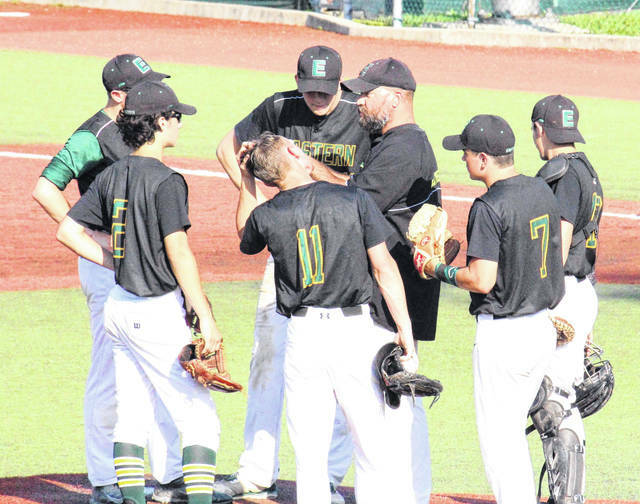 The Eagles’ last regional appearence was 2016 — when the current EHS senior leaders were up and coming sophomores — and they fell Sidney Lehman Catholic by a 2-1 count at Carleton Davidson Stadium in Springfield. This time, Eastern will be back at Beavers Field, a closer drive with a familiar atmosphere. The Eagles — the No. 1 seed in the Southeast District — found their way to the regional tournament after a 13-2 mercy rule victory over second-seeded Portsmouth Clay in the district final on May 16. Earlier in the postseason, the Eagles defeated Leesburg Fairfield by a 4-0 count for their fourth straight district semifinal win. EHS began the tournament with an 11-0 victory over Federal Hocking for the program’s 21st sectional championship and 13th sectional title in the last 14 years. In three postseason games, the Eagles have outhit opponents by a 31-to-8 clip, while committing just one error and leaving a total of nine runners on base. At the plate this spring, Austin Coleman leads Eastern with a .506 batting average, followed by Christian Mattox at .431, Josh Brewer at .421 and Ethen Richmond at .413. Kaleb Hill is hitting .386 this season, Nate Durst is at .373, while Matthew Blanchard is batting .347. Also over .300 for the Eagles, Ryan Harbour is hitting .320 and Owen Arix is batting .303. As a team, the Green, White and Gold have pounded out 280 hits, including 41 doubles and five triples. With combined total of 198 runs batted in, the Eagles have outscored opponents by a 269-to-52 tally in 28 games this spring. Led by a trio of aces, the EHS pitching staff is responsible for 11 shutouts and has held opponents to a .172 batting average. Richmond has a 7-2 record with a 1.46 earned run average for Eastern, Coleman sports a perfect 6-0 mark with a .64 ERA, while Mattox is 4-0 with a 1.35 ERA. 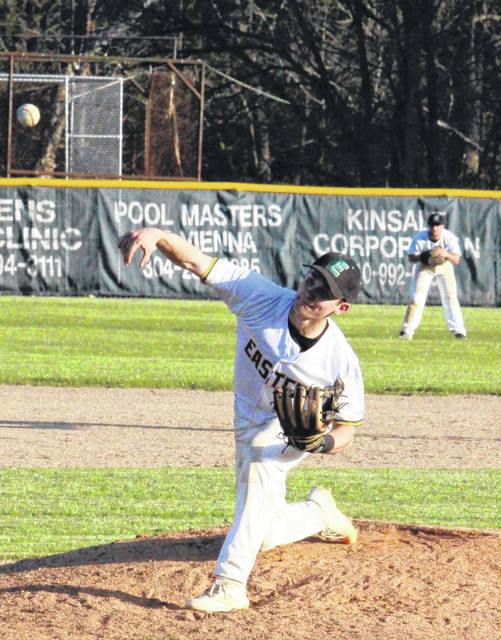 Coleman earned the pitching victory in Eastern’s sectional final, Mattox got the win in the district semi, while Richmond claimed the ‘W’ in the district final. The Eagles’ opponent, Centerburg — the second-seeded team in the central district — enters the Sweet 16 for the first time in school history after defeating Fisher Catholic by a 5-4 count in the district final. Earlier in the postseason, CHS defeated Grove City Christian by a 9-7 tally, Fairfield Christian by a 12-2 margin, and Harvest Prep by a 24-0 clip. Of the Trojans’ 50 postseason runs, 27 have come in the first inning. In two district games, Centerburg scored 12-of-14 runs in the opening frame. So far this postseason, Centerburg has belted out 51 hits, 16 of the extra base variety, while committing seven errors and leaving 24 runners on base. The Trojans outscored opponents by a 211-95 clip this season, while shutting out six teams. Jackson Goulter and Brenden Christy each have two pitching victories for CHS this postseason. Goulter — the Central District Player of the Year — had a 1.22 ERA and 47 strikeouts in the regular season, while Christy had a 1.45 ERA and 40 strikeouts. Joining Goulter on the all-district list for the Trojans are Christy, J.J. Davis, Trey Purdy and Dallas Scott. Davis has 38 runs and 20 stolen bases to his credit as leadoff batter, while Christy has scored 36 times and Goulter crossed home 33 times. Goulter has team-highs of 31 runs batted in and two home runs this spring. Centerburg — led by head coach Joe Smith — has won six straight games and 16 of its last 18, with the only team to beat the Trojans in that span being Fredricktown, by a single run on both occasions. CHS was fourth in the Knox Morrow Athletic Conference in the inaugural year of the league. The Trojans are 16th in the latest Ohio High School Baseball Coaches Association Division IV poll. Last season, Centerburg was a district semifinalist in Division III. Across the bracket, and playing after the Eagles and Trojans at Beavers Field on Thursday, are Whiteoak and Toronto, the top seeds in their respective districts. The Wildcats are atop the OHSBCA Division IV poll for the the third straight week, while the Red Knights are fourth and the only other team to be on top of the poll this season. The Eagles faced both WHS and THS at VA Memorial Stadium in the regular season, defeating Whiteoak by a 5-3 count on April 27, and falling to Toronto by a 8-0 tally in a weather-shortened game on April 6. Whiteoak is the Southern Hills Athletic League Division II champion, a district champion for the second time in program history, and enters the regional tournament with a 26-2 mark. WHS advanced to the regional by defeating Waterford 10-0 in five innings on May 16 in Chillicothe. Toronto is Ohio Valley Athletic Conference 2-A runner-up and enters the regional tournament with a 21-4-1 record. The Red Knight claimed a 6-0 victory over Strasburg-Franklin on May 16 in Minerva, giving THS its third straight district title and the 300th win in the tenure of head coach Brian Perkins — the 2018 East District Coach of the Year. The Region 15 final is set for Friday at Beavers Field, where first pitch is slated for 5 p.m.